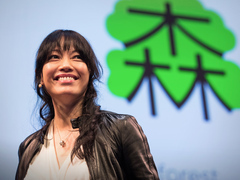 To an outsider, the Chinese language “seems to be as impenetrable as the Great Wall of China,” says ShaoLan Hsueh in today’s talk, given at TED2013. Hsueh’s mission over the past few years has been to break down that barrier, making reading and writing in Chinese accessible to people who didn’t grow up doing it. ShaoLan: Learn to read Chinese ... with ease! Her solution? A method she calls “Chineasy.” To achieve basic literacy, Hsueh says, you need only know 1,000 characters, and the top 200 allow you to comprehend 40 percent of basic literature. Chineasy involves pairing characters with facial expressions, body movements and images that conjure up words in English. These eight characters “are the building blocks for you to create lots more characters,” Hsueh explains. Using Chineasy’s simple, beautiful illustrations, it’s just a hop, skip and a jump to many other words and phrases. In this talk, Hsueh takes us through almost 30 characters; here, some more examples based on those foundational eight. In her talk, Hsueh shows us how combining fire (火) and mountain (山) gives us a volcano (火山). What happens when we add a mouth (口) to a volcano? Think about it: the mouth of a volcano is … a crater! Hi！ Shaolan, great to see your learning way for Mandarin match mine. I am a Mandarin teacher in USA. I teach in public English &’Mandarin bilinguard elementary school. I graduated in Chinese literaual major in Taiwan. I had Established a Mandarin immersion preschool for a school district in USA. Using the way like this. I made all materials all by myself, but didn’t put into the technology. Hope you can continue to make it thought. This is a awesome approach! However this is not new and the way to learn Chinese, in my opinion, would be losing its flare in the long run. Learning a language is a repeating and consistent process, it takes time and efforts! Fortunately there is a shortcut to learn the the language, which is to learn the radical of the characters first, which by itself usually has a hint from the writing (or drawing) and then forms the character. Many thought it is difficult to learn Mandarin Chinese. In my view, it is not true! It takes time and efforts to learn it well, but what doesn’t? On the contrary, Chinese is one of the most interesting languages in the world to learn! Because Chinese is a picture language, which means ancient Chinese people draw different pictures as Chinese characters out of everything they saw in the environment! Thanks Hsueh for gathering and sharing such an insightful information regarding Chinese learning. Good approach to learn Chinese. This “solution” for learning Chinese won’t actually teach you anything useful. That is misleading rubbish. The parallel between Chinese characters and English words is best described as syllables. e.g. take the English word “outstanding”, break it into 3 syllables: out-stand-ing (or out-stan-ding). If we were talking Chinese, the word would comprise of 3 different characters “out”, “stand”, “ing”. Now, supposing you had used Hsueh’s method and learnt the characters for “out”, “stand”, “ing”, then you saw the word “outstanding” in a book, would you have any idea what it meant? No, probably not. Something to do with standing up? Present tense? Outside? Then how about its meaning in the context of a sentence? Not a hope! The fact is, you cannot read Chinese just by recognising the different characters, because it’s the WORDS and the SENTENCES that matter! Two Chinese characters make a word, and a word can have a completely different meaning to the characters. “Oh! but I know 200 characters, including 了 and 解, so when I see 了解, I will know what it means!” Sorry, no you won’t. There is no correlation at all. My reply: you get a character that’s useless, never used in normal language. Why would you waste your time with this? If you try to use this character to say “Isn’t the sun BRIGHT today”, nobody will understand. the way to learn a language is through listening, learning and reviewing COMMON DIALOGUES, sentences, conversations, common words and grammar. In the case of Chinese, you will pick the characters up as you go along, but never mistakenly assume that the number of characters you KNOW is in any way proportional to your fluency in the language. 1) Do not spend time on learning to hand-write characters! It’s nice, but not essential, computers make typing them very easy; saves you 50% of the time you’d spend penciling thousands of characters. 2) Use the logical structure of Chinese vocab! There are a finite number of elements, with practice and a good method, this makes building your vocab fast and efficient, especially after the beginner stage. 3) Do not just grind through vocab, also practice use of the language i.e. reading, listening, speaking! A little bit every day will vastly improve your progress and performance. can’t say this is anything new as such… still good to try and open Chinese and Asian languages to the world; they are the future! Not directly Spanish related, but a great reminder of the power of word association and mnemonic devices! Simply amazing, very innovative. Can’t wait to learn the language.